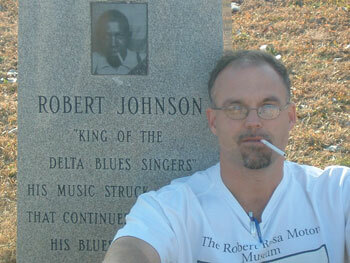 Strait, imitating Robert Johnson's tombstone picture, at one of the "King of the Delta Blues'" three gravesites. A visit to the site is part of the field trip's itinerary. It is said that Robert Johnson was a marginal guitarist at best until the night he went to the crossroads near Dockery’s plantation. By the light of the full moon, the devil shows up, tunes Johnson’s guitar for the price of his soul, and Johnson emerges, king of the Delta Blues. One of Johnson’s three gravesites and Dockery farms are among the many stops in learning the geography of the blues for one of Strait’s classes. The difference between the independent study course (Geography 475) and other geography classes: you literally stop, because the class takes place on the road during a five-day field trip. For the second year, Strait’s “Race, Blues, Rock ‘N Roll and the Geography of the Mississippi Delta” class will travel through Tennessee and Mississippi, departing May 18, to discuss emerging topics in geography. At first glance, there may not seem like much of a correlation between the blues and geography, but to Strait, it’s all about perception. For the class, the blues is used “as a lens to understand the cultural geography of the south, specifically, but in some regards, the entire U.S.,” he said. Civil rights, tourism and the use of musical heritage, urban revitalization, migration, economic change, racial segregation and how history is written: all of these things can be understood geographically, Strait said. For example, the Mississippi Delta embraces the notion of heritage tourism by utilizing “The Blues” label for its museums, “some of which are funded by the Smithsonian; some of which are mom-and-pop type places,” while other places have used recording studios and museums to essentially revitalize neighborhoods, Strait said. The evolution of the blues itself also reflects changes in history, as “the people playing it, listening to it and consuming it transitioned from a rural life to an urban life,” Strait said. “The blues in Chicago sounds very different—different themes are discussed, it sounds different, played in different types of places—than you would have seen in the Mississippi Delta in the 1930s,” he said. Among the places Strait will use to demonstrate these topics are Graceland, “the Mecca of American Culture;” the Sun Records Studios, where musicians such as Elvis, Johnny Cash and even U2 have recorded; and Po’ Monkey’s Lounge, which “claims to be one of the last remaining juke joints” and has been featured on the “Today” show. 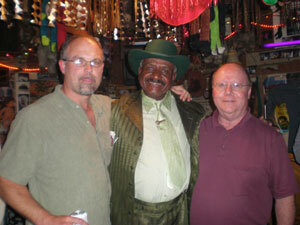 Strait and geography professor Jim Tiller (on right) stand with Po' Monkey's Lounge owner Willie Seaberry. He will also take students to the Fitzgerald’s Casino and Hotel, built in a region that was “predominantly cotton agriculture and was historically very, very poor. Students will also hear from an individual engaged in registering people to vote in the 1960s, who will discuss their use of music to organize and even raise money for their efforts, as well as an ex-sheriff who arrested him for trying to register people to vote. “They’ll essentially get direct experience with people who were involved in things you learn about in books, but there’s another level of education that goes into talking to somebody about that, I think,” he said. As part of the coursework, students will have reading packets and will be divided into pairs to document their trip and how it fits into one of the geographic themes. Students will present the work when they return to Huntsville. Though this is his second time taking the field trip at SHSU, he has also directed the trip four times at Louisiana Tech, where he taught for three years, including twice as a workshop for public school teachers to help them design their geography curriculum, and also for the American Association of Geographers. “Race, Blues, Rock ‘N Roll and the Geography of the Mississippi Delta” will be offered as a first summer session course for one to three credit hours, even though the trip will be over before the session begins. Students will be required to pay tuition, as well as accommodations and food, which Strait estimates to be less than $300. Those interested in signing up should contact Strait at jbs008@shsu.edu or 936.294.4077.